Trilobites like the one shown above are well known to most collectors of fossil invertebrates (animals without backbones). This trilobite, which is 4 cm long, has a cephalon or head (with eyes), a thorax (body with many segments), and a short pygidium ("tail"). This particular specimen is an Elrathia kingi of Middle Cambrian age (see time diagram below) from the Wheeler Shale near Delta, Utah. 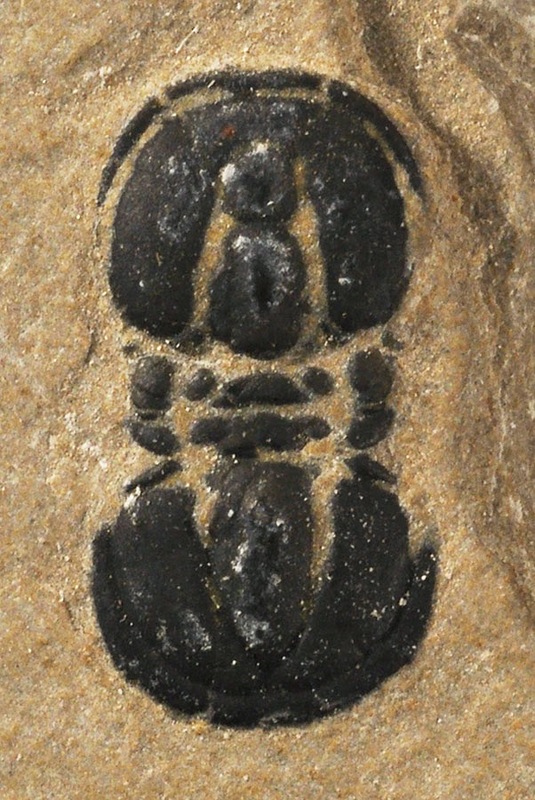 Another type of trilobite found alongside E. kingi is Itagnostus interstictus, until recently known as Peronopsis interstrictus, which belongs to one group of so-called "blind" trilobites. Technically speaking, "blind trilobites" were not blind because they never had eyes. Itagnostus is an agnostid trilobite, which are characterized by having a thorax consisting of only two segments and a cephalon and pygidium of approximately the same size. This is a "cluster" of two specimens of Itagnostus interstices. The largest specimen is nearly 1 cm long. Thank for the information. My students think Trilobites are "cool" and will enjoy learning more. These kind of trilobites are very interesting! They have no eyes and yet some how found their way around to food and avoid predators. Did they just disguise them selves as rocks so they wouldn't be eaten? Such an odd creature. These guys are very interesting! how did they find food? they must have had some sort of sensory device. And to avoid predators they must have disguised them selves as rocks or something. It is a mystery to why they would evolve to be like this.